April Kennedy...My Life + My Style: WHAT A WEEKEND. WELL EXTENDED WEEKEND THAT IS.....It was fun, scary, fun, rainy, fun, bummer, and did I mention fun! 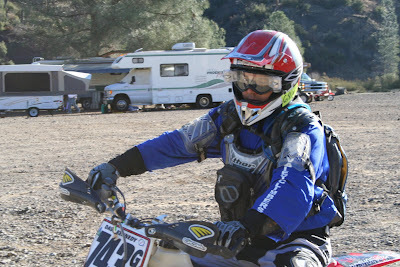 We headed up to Stonyford for the ever so popular WFO Enduro Race. Our club puts on the race. We set up the course, work the race and tear down the race. It is always a fun weekend with a good 30 families or more. The kids have friends to play with, Dave gets to ride his dirt bike until his little heart is content and I get to hang out with the wives! 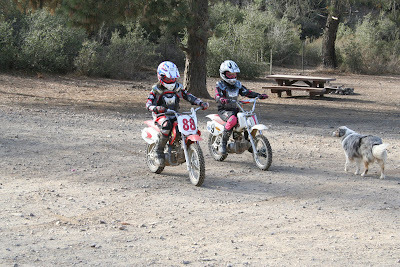 The kids really had a great time riding this year. 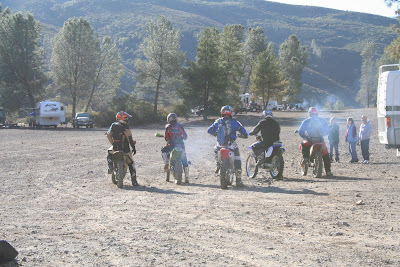 Kaia and her friends E and S would get all 'geared-up' all by themselves, start their dirt bikes and take off riding on the little trails all around our camp. 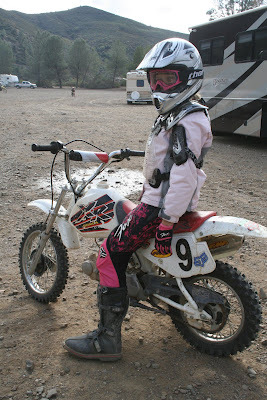 They were all decked out in their pink riding gear! 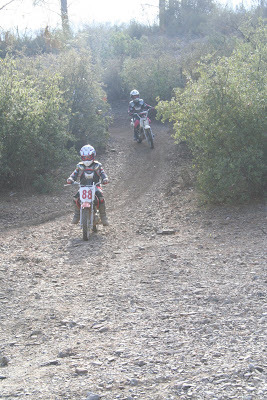 The race this year had a special section called an Enduro Cross or Obstacle Course section. This section was considered 'spectator friendly' and we were all looking forward to being able to watch part of the race this year. A group of us moms took our kids out to the race to watch. It was fun and exciting, but in the back of my head I knew it could be a little dangerous. I felt strongly to move Blake and his little five year old friend to a different area of course to watch. I failed to move my daughter with her little friends E and S at the same time. I could kick myself now. A dirt bike rider ended up with a freak accident (his hand got lodge between his throttle and brake lever and while he was trying to dislodge his hand by pulling it out, it gased the throttle and launched the dirt bike out into the crowd). It was horrible. It was traumatic. It was scary. It was just like the accidents that you see that are caught on tape and played on TV. 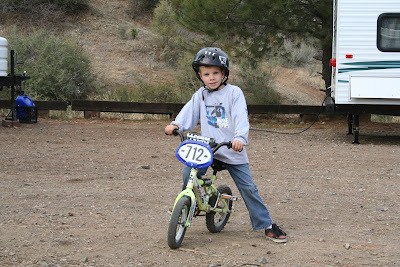 As I watched the dirt bike take off in the air...into the crowd...there was panic and confusion and wailing screams from mothers and children all trying to dodge the oncoming bike. I quickly focused in on my little Kaia, E and S all linked arm in arm watching the bike come straight at them. I then screamed, panicked and ran. Kaia ran one direction and S ran the other leaving sweet E standing right there in the middle with eyes wide open. The bike hit her. It threw her little body in the air with it, knocked her shoes right off of her. It hit her legs, the front of her face and as she tried to turn to hold the front of her face it knocked her to the ground face first with the dirt bike landing on the back of her head. It all happened so fast that I honestly didn't know at the time if it was E or Kaia. As I ran I heard E's mom scream her name. Somebody lifted the bike off E and she stood right up, looking to her mom and saying that she was OK. We quickly had her lay back down and calmed both mother and daughter down. Paramedics were on site but we were at least 1 hour away from a decent hospital by ambulance and that ambulance would have to come the hour to get her first. Paramedics decided to call for air transport and a helicopter was on its way. E actually stayed conscious the whole time. I stayed with E and her mom rubbing E's face while her mom held her hurt legs. I watched my daughter cry hysterically with sweet S off to the side but didn't want to leave E and her mom. A caring man from our club went to our daughters and comforted them and for that I was grateful. Blake also went to give his sister a hug and try to comfort her too. E was evaluated and complained of two hurt legs, which looked somewhat stiff and distorted. 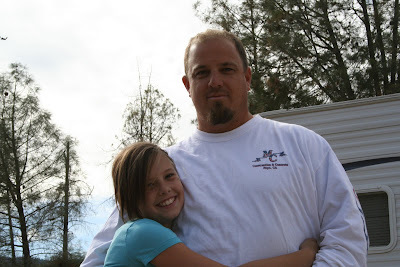 E didn't really complain of any head injury but it was decided that she needed to be airlifted to a hospital in Chico. Mom went with her and dad was notified and in his truck driving to meet them 2 hours away. We received word 2 hours later that E was leaving the hospital with only a bandaid on her elbow. What a miracle! Actually walking away from the accident without a broken bone. She and her family were back to camp and standing around the campfire 6 hours later. We all were truly grateful. Sports are dangerous...some more than others. I hugged Kaia tighter that night, actually the whole weekend, and today and will probably hold her for a minute tomorrow and the next. Blake, who had been standing in front of the girls was saved from that accident. I am so glad I had moved him. I have been hugging him more too. It was a lesson learned...or more importantly reminded of....when mom's feel instincts we should act on them. After the accident us moms talked. 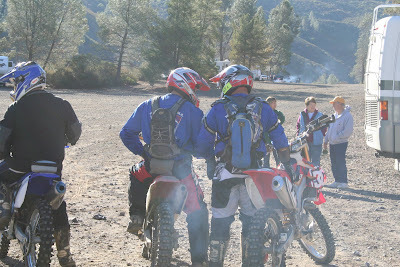 We all mentioned that we had thought at one time or another that it wasn't probably the safest place for us to be standing....but the excitement of the race and thought that something would really go wrong kept everyone from moving. E got a nickname that night...Her last name starts with a H...we'll use Henry for blogging purposes....Her new nickname...Hard Head Henry! And we are definitely getting her a shirt for next year that says "I SURVIVED the WFO!" The rest of the weekend was nice. Well that is until another rider crossed a trail in front of hubs and hit him, knocking him off his bike and causing him to break his wrist. That was a bummer. 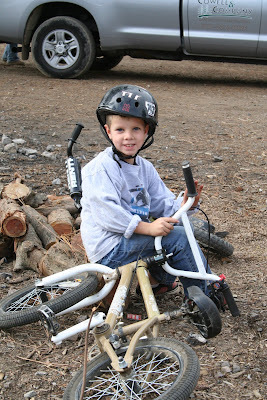 But after the accident that we had just witnessed....I was happy it was just a broken wrist. He just called...he got a blue Gortex cast (he really wanted black...but he knew the kids would want to sign it)! 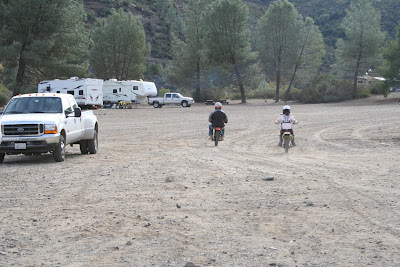 We stayed an extra night with the "Henry" family to let the kids ride their dirt bikes with less of a crowd. We were amazed all weekend that E was walking, running, riding and playing. She definitely had angels watching over her....special, special angels. Here are some pics from the weekend.....ENJOY! The guys going out to mark the course....their favorite part....they get to ride! 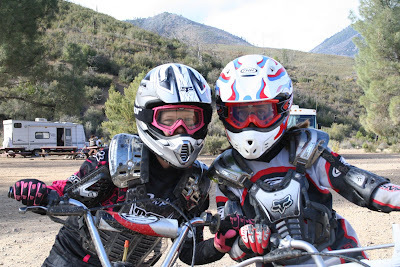 Kaia and E on their dirt bikes riding around camp...after accident...AMAZING! 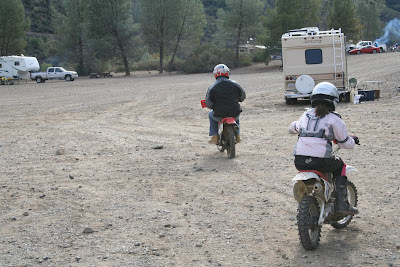 Dave (riding with splint on), Kaia and Blake hanging out and playing around camp. HUGGING THIS GIRL A LITTLE TIGHTER! Oh my gosh. That is one crazy story. I'm so glad that everyone is okay. I actually saw Dave driving today and I was wondering who got hurt after your last blog, but I was going the other direction and couldn't stop to talk. Can't wait to come to your hosue tomorrow for your yummy tarts! See you then. PS~I feel so honored to be your first comment. You always have so many now a days that I feel like I'm usually 20th or something like that. Glad to hear that your family was spared from any serious injury. Sounds like you were being watched over. Holy Moly! I was on the edge of my seat reading what happened to poor E. That must have been so scary! I am so thankful she didn't get hurt.